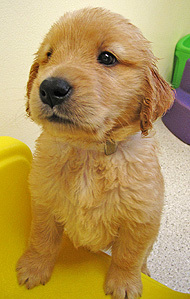 Use our new interactive brochure to learn more about the Pennies for Puppies / Dollars for Dogs program. The Seeing Eye Pennies for Puppies/Dollars for Dogs program offers groups of all ages the opportunity to participate in an educational community service project that benefits blind people from across the United States and Canada. Groups that have participated in the past include: school groups, Boy and Girl Scout troops, church groups, companies, service clubs, and senior citizen groups. Your group will receive an array of educational materials that describe how Seeing Eye® dogs are specially bred and trained to guide people who are blind and how the dogs enhance the lives of their blind owners by enabling them to be more independent. Depending on your location, Seeing Eye representatives may be available to deliver a live presentation for your group. Past youth group leaders commented on the benefits of teaching children empathy and the importance of giving to others. Adult groups appreciate the chance to build employee/group loyalty and team spirit while striving to reach a common goal – making a contribution that can change someone’s life. Your group will conduct fundraising activities to support The Seeing Eye. They can be as simple or elaborate as you’d like. School groups may collect donations over the course of a marking period or semester. They may also host a bake sale or collect donations at school concerts or plays. Adult groups may choose to request a per person donation to a presentation made by a Seeing Eye representative, conduct a “denim day” fundraiser in an office environment (where employees make a donation and get to wear jeans on a designated day), or host a spaghetti dinner, craft fair or other event. The possibilities are endless! Groups that raise $5,000 or more get to name their own puppy and follow its progress via letters and photos all the way through the Seeing Eye training program. Your group will receive free age-appropriate educational materials which may include comic books, coloring sheets, DVD’s and brochures. What Value will my Group get from Participating? Learn about diversity and inclusion of people with disabilities while showcasing the capabilities of people who are blind. Learn The Seeing Eye and how it breeds, raises and trains dogs to perform their important job of guiding blind people. Learn etiquette around people who use Seeing Eye dogs. Reinforce the importance of philanthropy and giving back to the community. 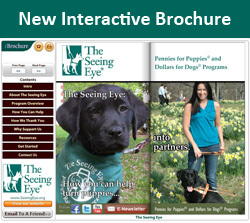 To learn more about the Pennies for Puppies/Dollars for Dogs program, or to get started, view our interactive brochure, email pennies@seeingeye.org or call (973) 539-4425, Extension 1778.